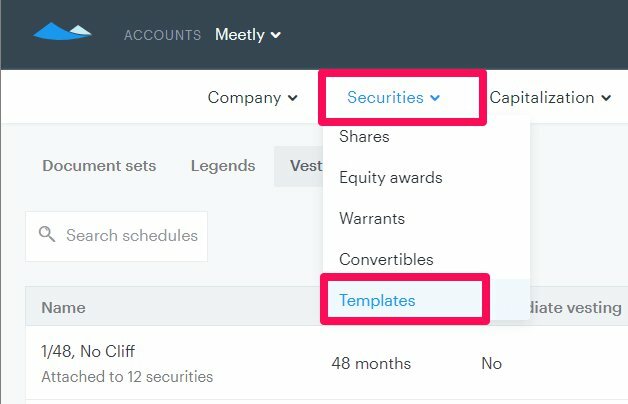 Vesting schedules can be created and saved in the 'Templates' so that they can be easily applied to certificates, equity awards, and warrants. Vesting schedule templates can be created by users with Legal Administrative permissions. 2. Enter the necessary information into the popup, such as the schedule name. 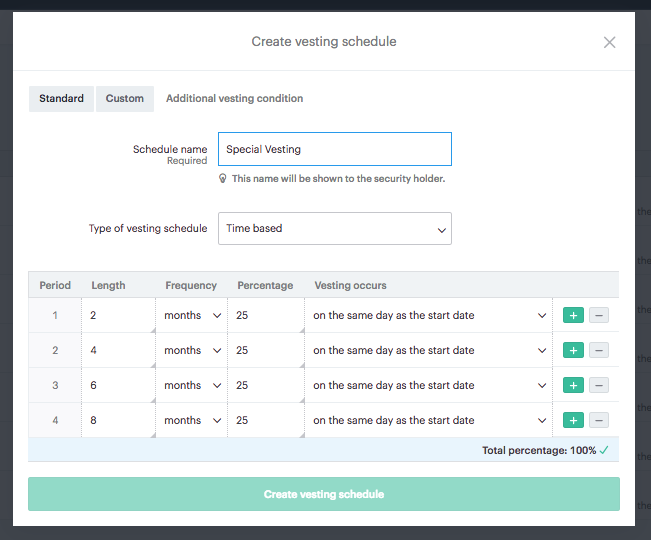 For a custom vesting schedule template, tranches can be added with various lengths, frequency (days/months/years), percentage (must total to 100%), and when vesting occurs. 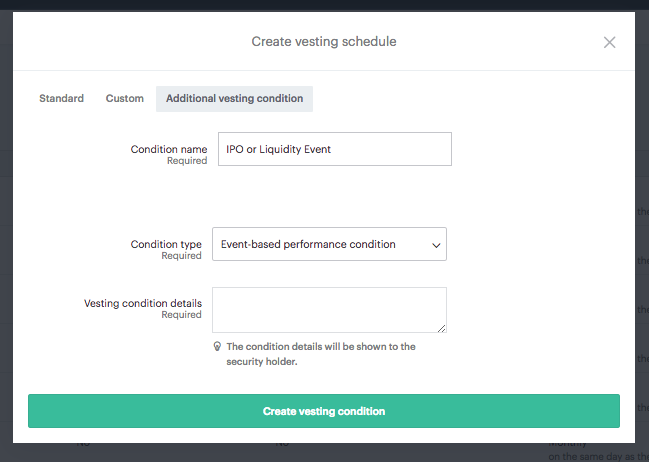 Once set, click on "create vesting schedule" to save. 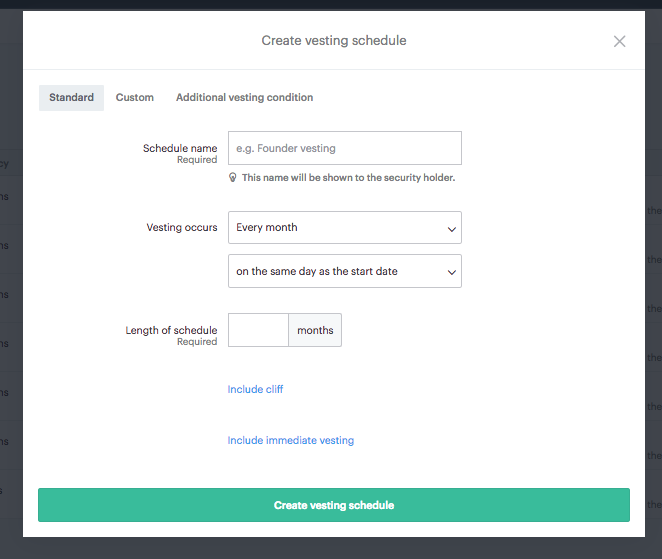 You will then be able to apply the schedule template to any securities that you wish. 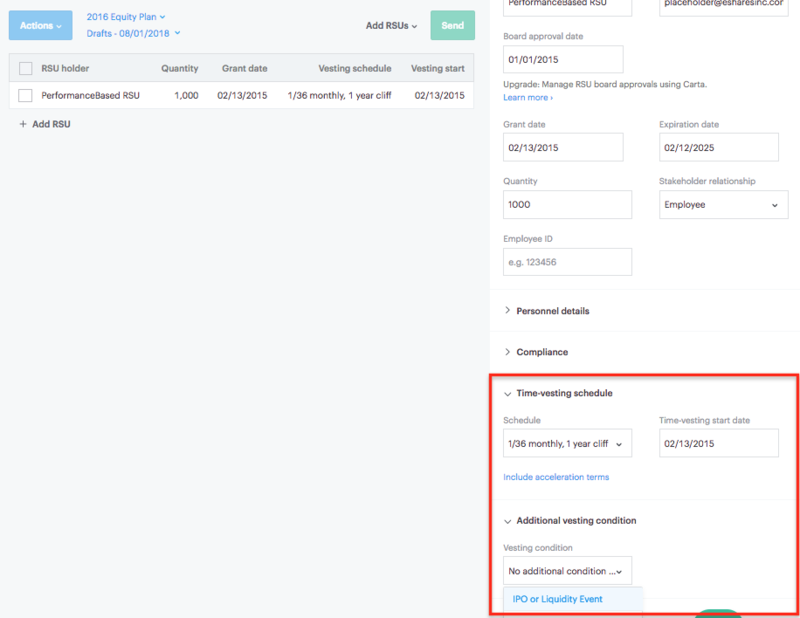 Additionally, you can select an additional vesting schedule which will allow you to apply both a time-based vesting schedule and a performance-based vesting schedule for restricted stock units only. This vesting schedule is intended to be used by companies that issue restricted stock units that have a time-based vesting schedule but do not truly vest until the performance-based vesting condition is met. At the time of performance achievement, the time-based vesting that occurred in the past, will be attributed in the current period and any time-based vesting remaining for future periods will accrue based on the time-schedule. 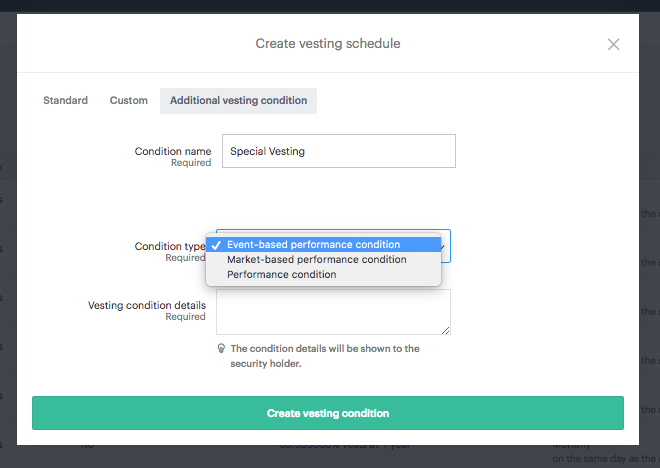 When using the additional vesting condition, you will have the option of indicating what type of condition should be applied to accurately represent the restrictive conditions. The options include event-based performance condition, market-based performance condition, and performance condition. Event-based performance condition: a firm-wide condition that is satisfied after an event that affects the company as a whole such as an IPO or an acquisition. Market-based performance condition: a condition that becomes satisfied upon a market event such as the company reaching a valuation of $500 million or the stock price reaching a value of $50 per share. Performance condition: is more of an individual-focused event such as Ted Baker, the company's Director of Sales achieving a sales goal of 1,000 subscription licenses sold in his first 100 days of employment. 3. 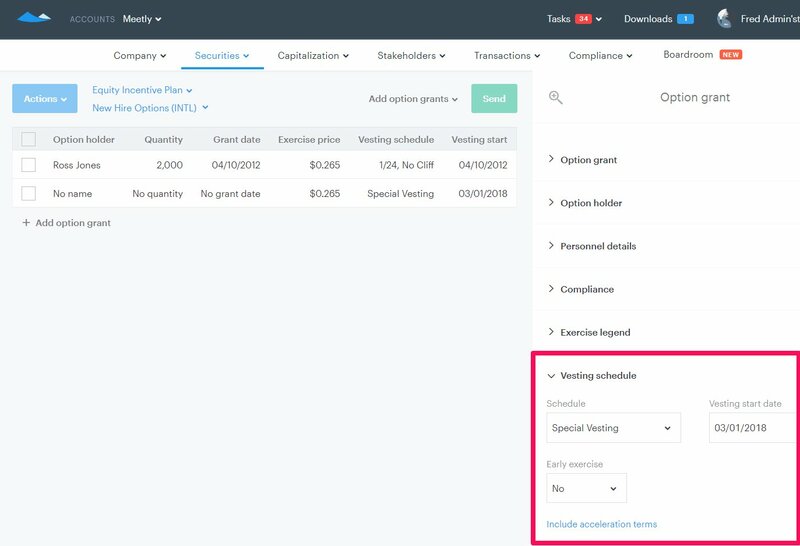 You can apply the Standard or Custom vesting schedule in the draft creation process for option grants and 'Include acceleration terms' or selecting 'Add vesting schedule' from the drop-down bar for the appropriate security. For restricted stock units only, you can choose to apply the additional vesting condition when you go to draft new RSUs.